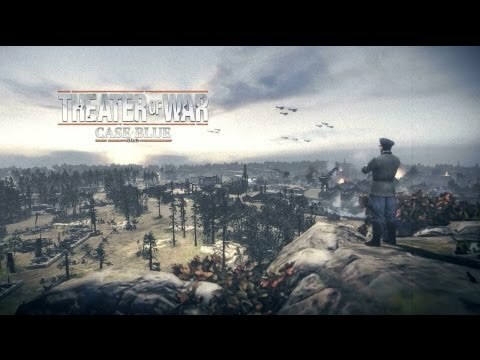 Download game Company Of Heroes 2 - Case Blue DLC right now! NOTICE: Requires the base game Company Of Heroes 2 in order to play. Activation key must be used on a valid Steam account, requires internet connection. Take part in a series of scenarios, challenges and battles based upon this operation. Command of the mighty German war machine and lead their forces from spring through to the harsh winter of 1942. VORENEZH, RUSSIA, USSR June 28 1942. Germany’s summer offensive aims to secure multiple routes to Stalingrad, but the Red Army holds defensible positions along the Don River. Team up with a friend to capture and hold the large Russian city of Voronezh, one player must defend the city with infantry forces while the other breaks through Soviet defenses with heavy armor support. Bring armor into the city and secure victory for the Wehrmacht. Play with a co-op ally: Player 1 (top) commands vehicles; Player 2 (bottom) commands infantry. VOLGA RIVER BASIN, RUSSIA USSR. It is September 1942 and the Wehrmacht has nearly reached Stalingrad. The Soviet forces pushed back by the Case Blue advance have dug in and prepared for the upcoming German assault. As the commander of a prototype Tiger Tank you are at the spear head of Army Group B. NEAR STALINGRAD, RUSSIA, USSR. It is November 1942, the Soviets tenaciously hold on to Stalingrad, despite terrible losses and scarce supplies. To finally break the defenders and drive them from the city you must break their supply lines. Use a small force of Pioneers and Grenadiers to prevent Soviet supply convoys from reaching the city. DON RIVER VALLEY, USSR. The Russian winter of December 1942 has halted German advances into the Soviet Union. Taking advantage of the treacherous conditions, the Red Army has launched a massive counter offensive. Along the Don River the Wehrmacht’s flank is under coordinated attack from two Soviet battle groups. Marshal your forces and wield the power of your devastating howitzer artillery to stem the Soviet tide. KHARKOV, UKRAINE, USSR. It is May 1942, the Red Army has retaken the industrial city of Kharkov and is beginning to take initiative in the second year of its war with the Third Reich. Marshal Timoshenko’s forces are overextended, take advantage of this and recapture the city with the Wehrmacht’s sixth army. The defending Soviet forces will not give ground easily.